Mike Mignola’s most famous creation may be in the headlines for a new cinematic outing, but this week marks a more significant milestone for the “Mignolaverse”: the final issue of B.P.R.D. : The Devil You Know, the conclusion to years of stories set within the world of Hellboy, Abe Sapien, Kate Corrigan and dozens of other unforgettable faces. Mignola, along with contributors like John Arcudi, Duncan Fegredo, Laurence Campbell, Guy Davis and many more, have handcrafted a world where Lovecraftian cosmic terror intermingles with Universal Monsters-style nostalgic horror, where Arthurian legends interact with Russian folklore—and where regular folks are caught in the middle. Even the protagonists who don’t quite qualify as “regular,” be they were-leopard, pyrokinetic or an heir to Hell, still stand out within the long history of comics as some of the most fully rendered characters ever put to page. 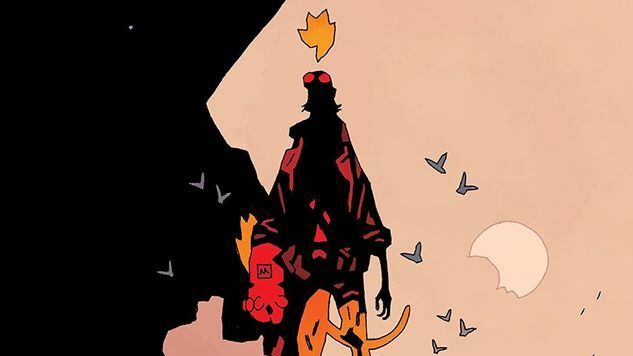 Rather than try to wax poetic about the decades-long saga, we’re going to take a page out of Mignola’s playbook and acknowledge that art can often tell the story all on its own. The gallery above contains 100 of our favorite covers from the sprawling world of Hellboy (excluding non-Hellboy Mignola series like Baltimore and Joe Golem), from the masterful Hellboy in Hell to brief spin-offs like Sledgehammer 44. Mignola himself is of course represented many times, but he’s also joined by some of the industry’s finest talent, including the Fiumara brothers, Becky Cloonan, Dave Johnson and master colorist Dave Stewart, who is responsible for the vast majority of the color art you see here. Whether you’re a franchise diehard or still debating taking the fiery plunge, prepare yourself to enjoy some of the finest covers to grace comic-shop shelves over the last 26 years.